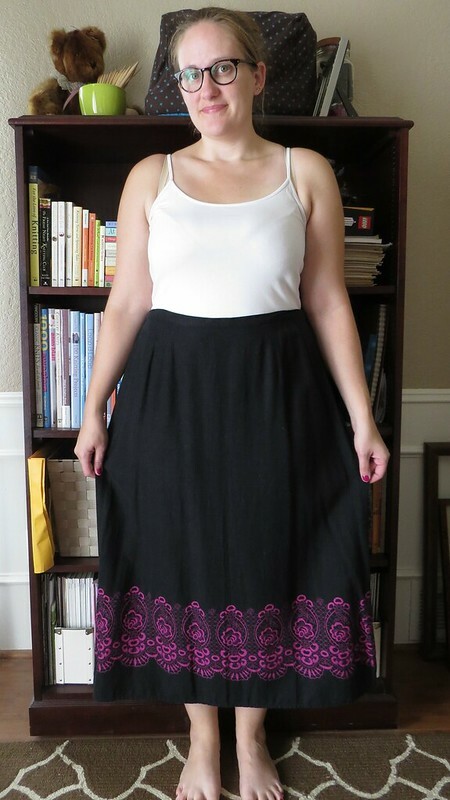 In the search for the perfect tunic materials last week, I came across this linen blend skirt from a clothes swap a year or two ago. I never really knew what I was going to do with it until now. I only snagged it at the end of the night because no one else wanted it, and come on, quality fabric and hot pink? 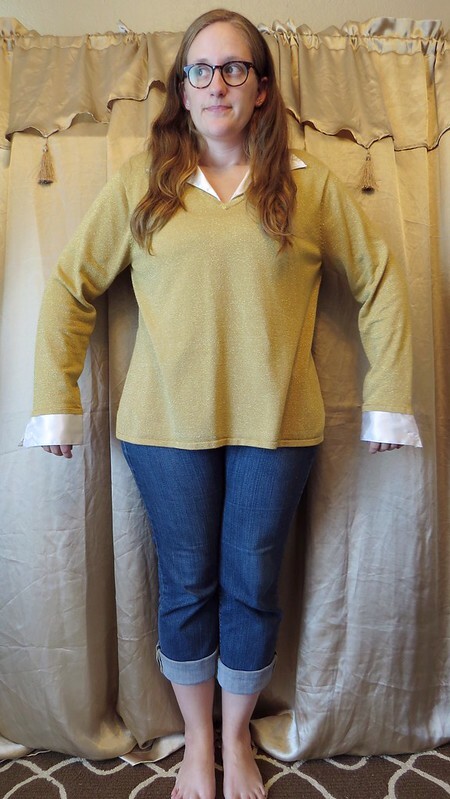 For the next Refashion Runway challenge - Tunic - I took inspiration from the traditional tunics of southern Asia, known as "kurtas," which are typically straight cut, loose fitting, collarless shirts that fall somewhere around knee length with slits up the sides. They can be made from a variety of materials, such as luxurious silks for formal occasions, simple cotton or linen for everyday summer wear, or sturdy wool during winter. 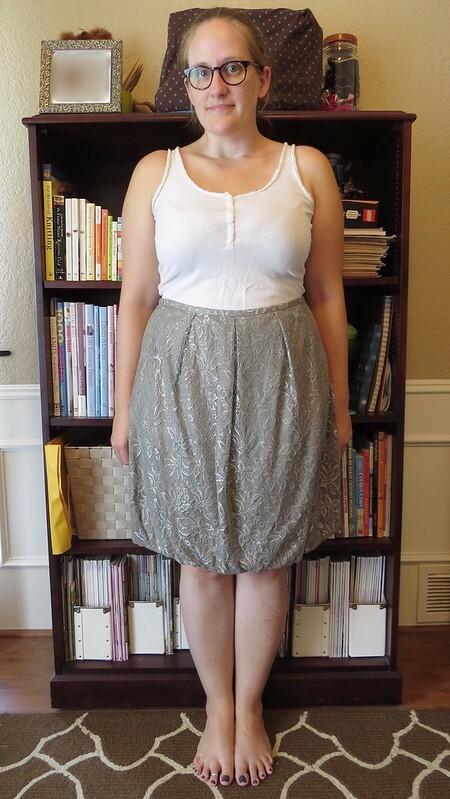 Rummaging through my refashion closet, I pulled out this skirt and top set in a linen blend, which I brought home from a clothes swap a couple years ago because I loved the pattern and fabric. Unfortunately, this fabric was a bit thin to be worn by itself, I thought, so I began to ponder my options for a lining. That's when the light bulb went on. REVERSIBLE! 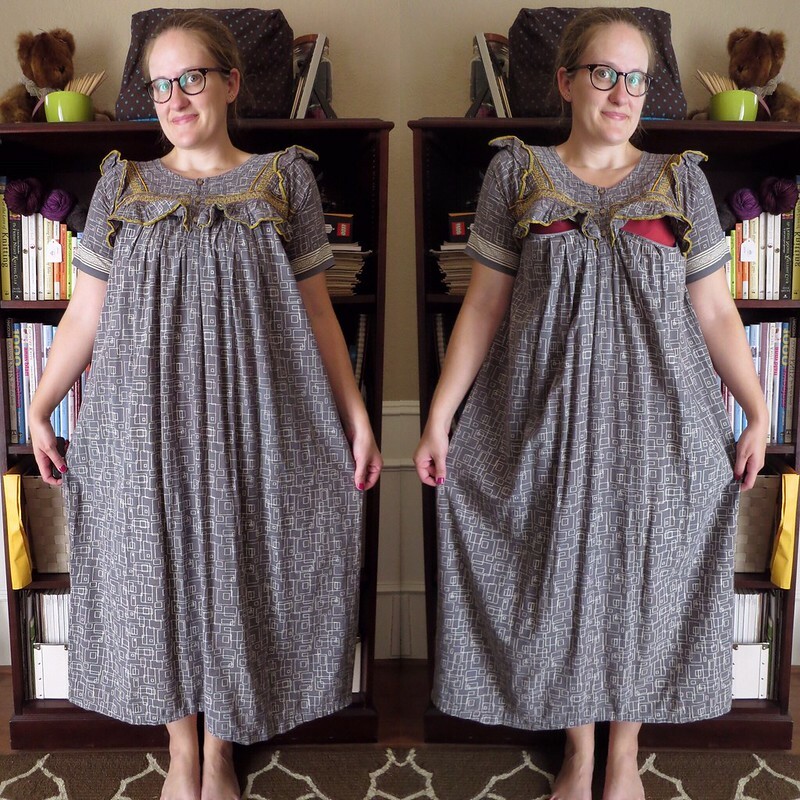 Another dive into the stash produced this cotton muumuu with convenient nursing zippers hidden under the front ruffles. This one came from Goodwill a while back for... $3? On this episode of Refashion Runway, the contestants were given the theme "Buttons" to inspire our creativity! Have a gander at my project below before you hop on over to The Renegade Seamstress to see the other entries and vote for your favorite! 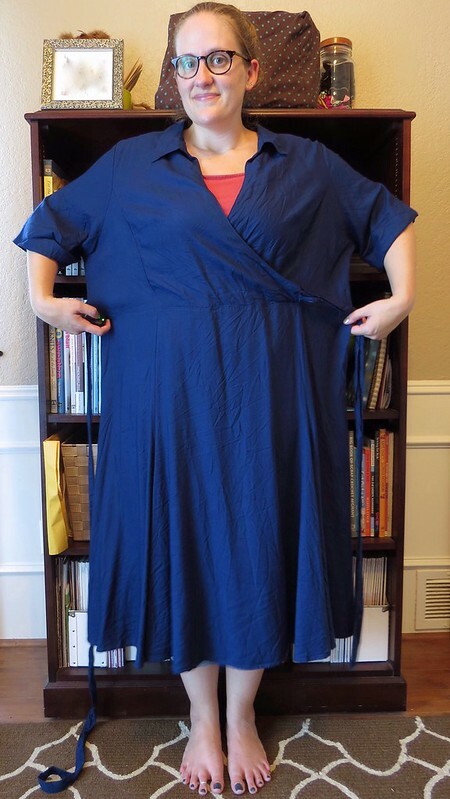 I picked up this giant, blue, faux wrap dress at Thrift City a couple months ago with the intention of turning it into the shirt dress of my dreams, and this button challenge played right into my hands! 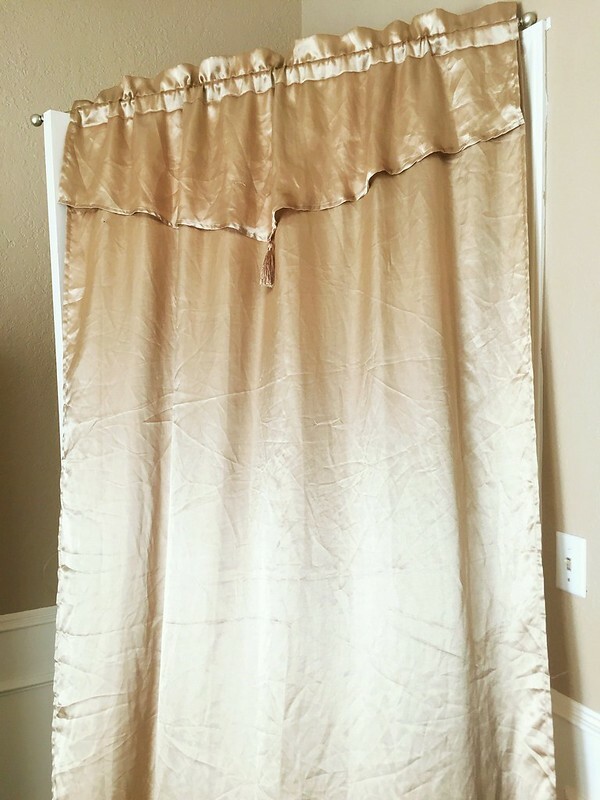 For last week's Refashion Runway metallic challenge, I had originally planned an all gold outfit, pairing this oversized gold sparkly sweater with my pleated curtain skirt. It's difficult to capture the sparkles, but trust me, they're there. I'm an overly cautious person. Always have been. So I like to have a Plan B, in case things don't work out the first time. I did this during Season Two - thrifted multiple themed and plan to continue to do so for the current season as well. In fact, for the velvet challenge, the project I submitted in the end was actually Plan C. Plan B was an utter disaster. As my husband put it, I looked like I was headed for a renaissance festival... to play the jester. Okay, so maybe it wasn't quite that bad, but certainly it wasn't competition worthy, or even Internet worthy for that matter. What follows was Plan A, which turned out fine, but I didn't feel it had that "wow" factor needed for the contest. 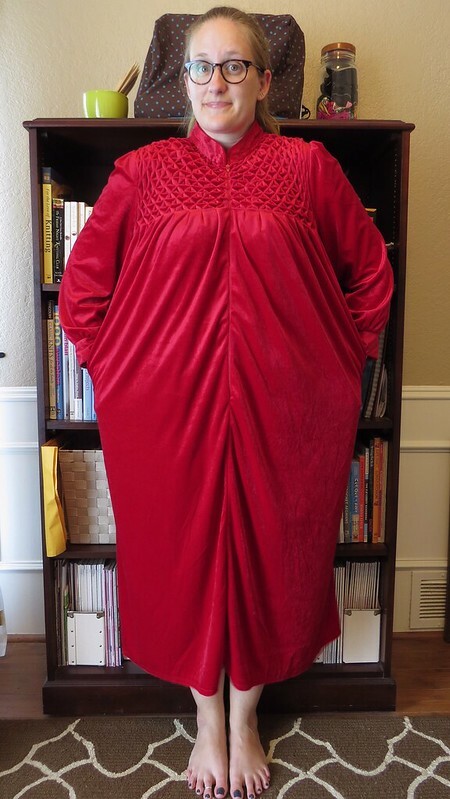 It began with this lovely smocked velvet robe. The latest season of Refashion Runway - the All Stars edition - is finally here! 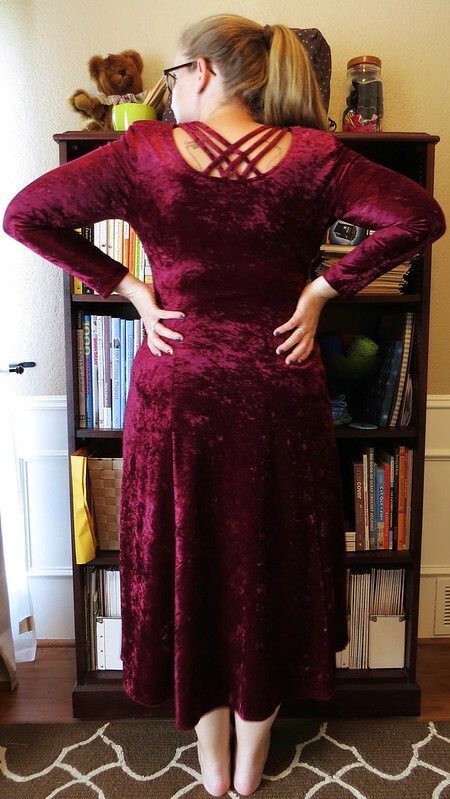 And we're kicking it off with a velvet challenge! This fabric has been all over the runways lately, and it's predicted to be all over a city near you soon as well. 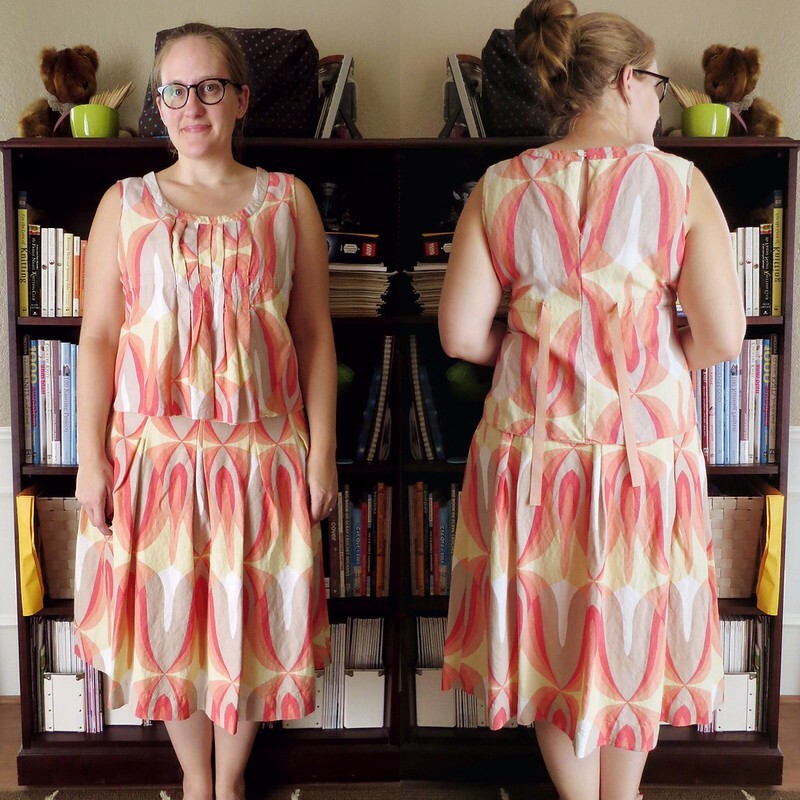 Once you've read my submission below, be sure to click over to The Renegade Seamstress to check out the other entries and vote for your favorite! 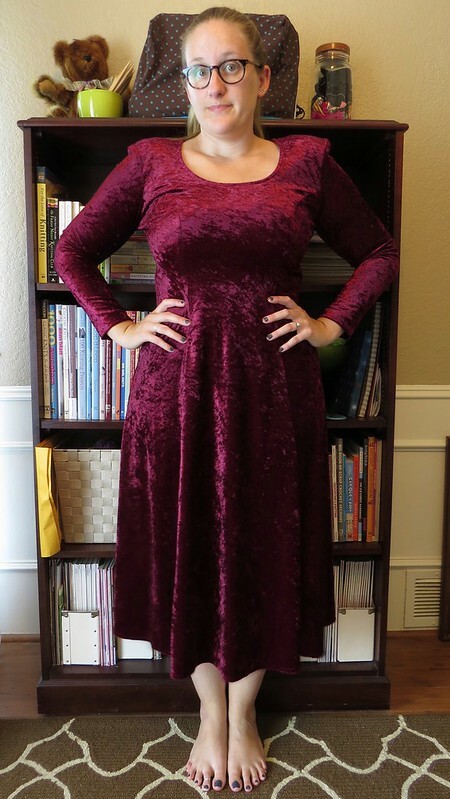 I found this 90s crushed velvet dress at Thrift City recently and knew it'd be the perfect starting point for a makeover. It had giant shoulder pads and was a bit too snug and too long, but I loved the color and the strappy details on the upper back. 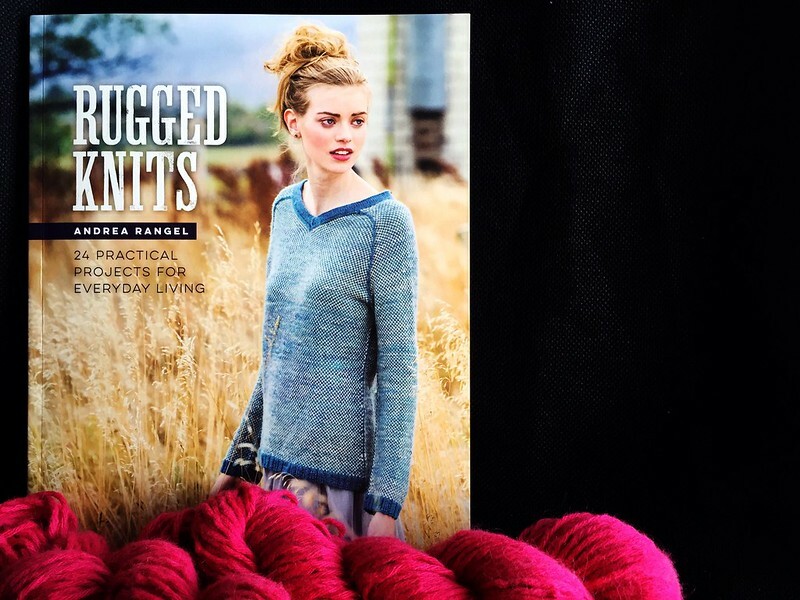 I recently received a copy of Andrea Rangel's Rugged Knits from Interweave and was blown away by the simple, practical patterns within. Ms. Rangel's designs aren't trendy or groundbreaking. They're made to last forever, both in terms of style and durability. I don't know about you, but if I'm going to spend weeks or, even months, knitting myself a sweater, I don't want it to look dated in a few years' time. 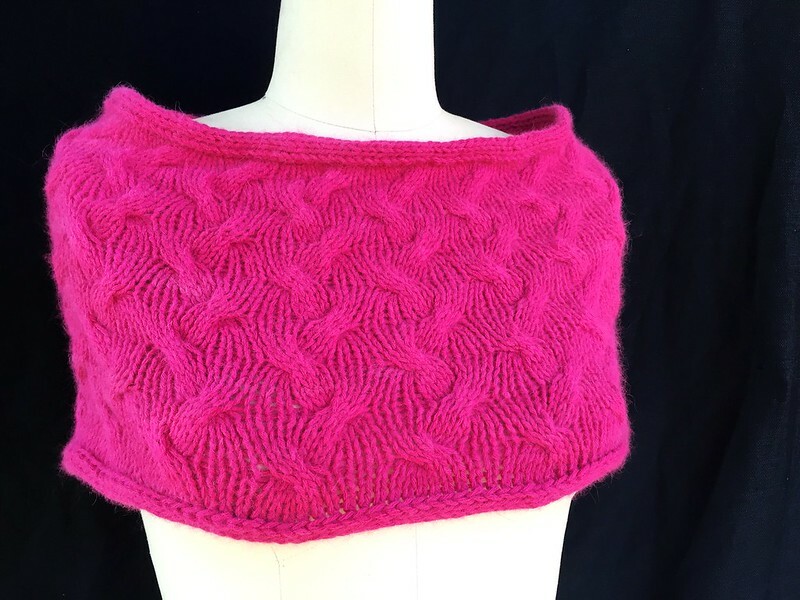 I was particularly drawn to the Blackberry Grove cowl, which flares slightly to fit over the shoulders if you prefer to wear it that way. 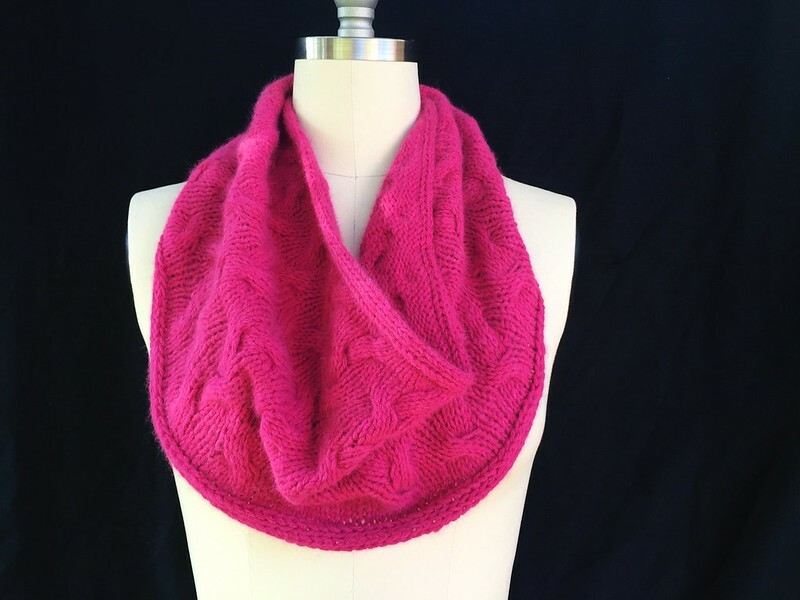 This is accomplished by working each cable repeat with progressively larger needles. 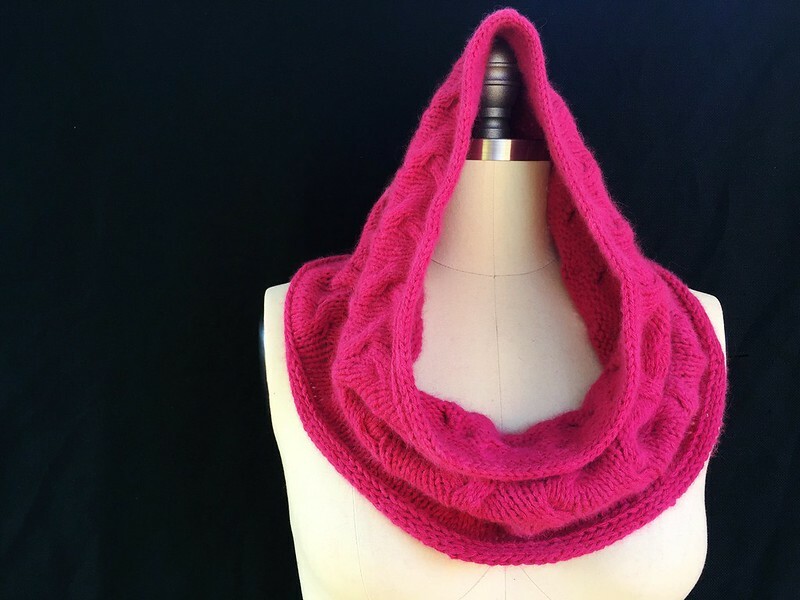 I used some long-time stash yarn - Elsebeth Lavold Angora in Magenta - which was not quite as thick as the super bulky yarn the pattern recommended. I compensated by going down a needle size across the board, but also casting on enough stitches to do three additional repeats of the cable pattern around the cowl. And to make the cowl roughly the same height as the original, I did one more repeat of the cables vertically as well on needles one size larger than the last repeat. I found the instructions to be well-written and error-free. Once the weather cools off and I can stand to have more wool on my lap, perhaps I'll whip up one of the lovely pullovers from this book!